The FTB4700 Series is a plated brass meter ideal for water applications in the ranges 0.2 to 18 GPM. 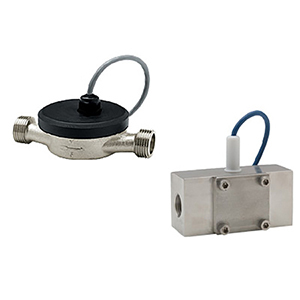 The FTB4800 provides a wide range flow metering in an extremely rugged stainless steel package. Single-jet simplicity combined with high quality jewel bearings result in long life and relatively high tolerance for problem fluids. Typical applications are chemical batching, proportional chemical injection, fertilizer injection, proportioning of spray chemicals, and general flow rate monitoring. The FTB4700 is available with ½ or ¾" male thread, with union-type meter couplings. The FTB4800 is available with ½, ¾ or 1" female threads. A square wave output makes the FTB4700 or FTB4800 series ideal for many OEM control applications. This signal interfaces easily with programmable logic controllers and computer input boards. The FTB4700 or FTB4800 Series meters can be combined with the DPF701-A panel flow meter for reading flow rate or total flow, with 4 to 20 mA output. 참고: FTB4700 Series comes complete with 2 MNPT couplings (already installed), one 3.7 m (12') sensor cable with connector, and operator's manual. FTB4800 Series comes complete with 5.5 m (18') sensor cable and operator's manual.